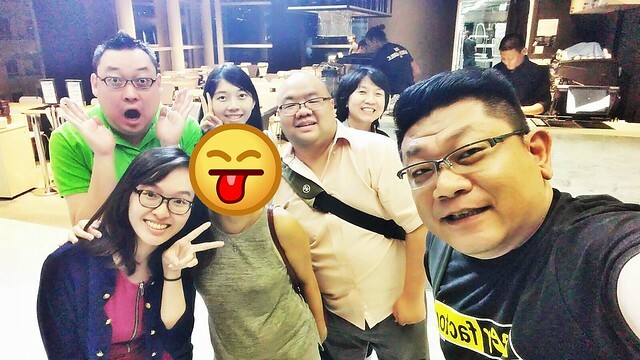 Attended with representatives from Chubby Botak Koala, Little Tiny Sun, Purple Taste, Epicurious Caniggia, msginginly, and Her Pen And Fork. Budget about SGD $25 per person. 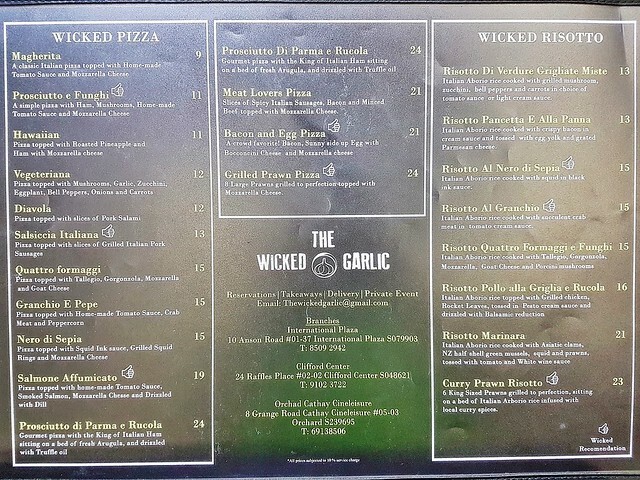 Established back in May 2013 in International Plaza, The Wicked Garlic is a casual Italian eatery, well known for their tasty, good quality Italian dishes, many of which feature hand made sauces or fresh seafood. Coupled with wallet-friendly pricing, The Wicked Garlic has grown and expanded solely by word-of-mouth, having little to no actual marketing. They've since opened their 2nd outlet in Clifford Centre in October 2015, with their 3rd outlet in Cathay Cineleisure Orchard opening in August 2017. 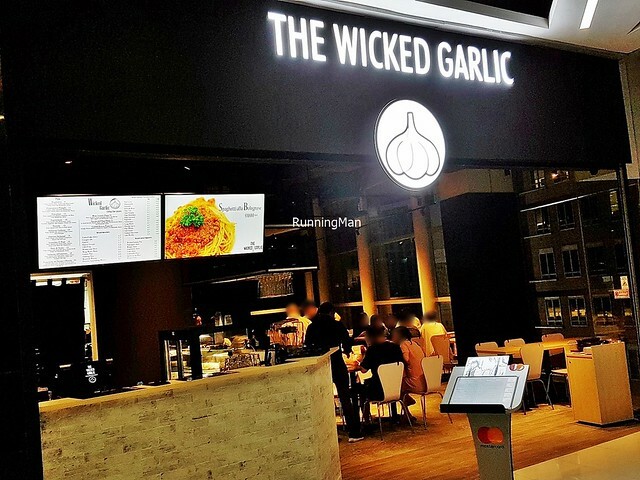 Ambience at The Wicked Garlic is basic and functional. Simple colours of black, white, and wood, with basic functional furnishings neatly aligned within the space. Ample natural light during the day, with low white lighting at night. The place is decently comfortable, though peak periods can be buzzing and noisy. There is little other decor to speak of. 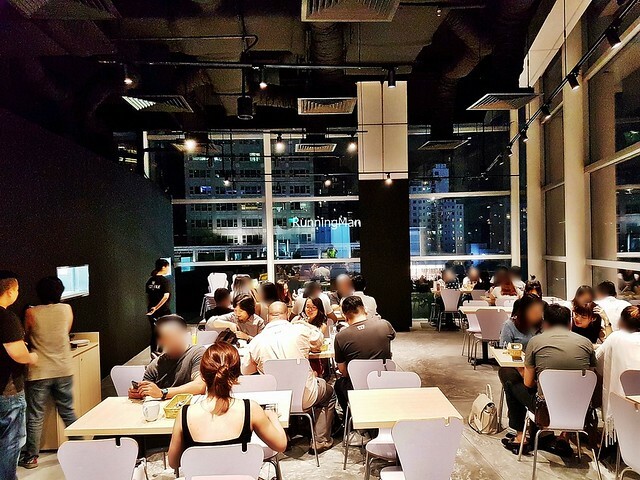 The 3rd outlet has the largest floor space and the most seating, if you're visiting the 1st or 2nd outlet, which have limited seats, be prepared to queue for up to 30 minutes. 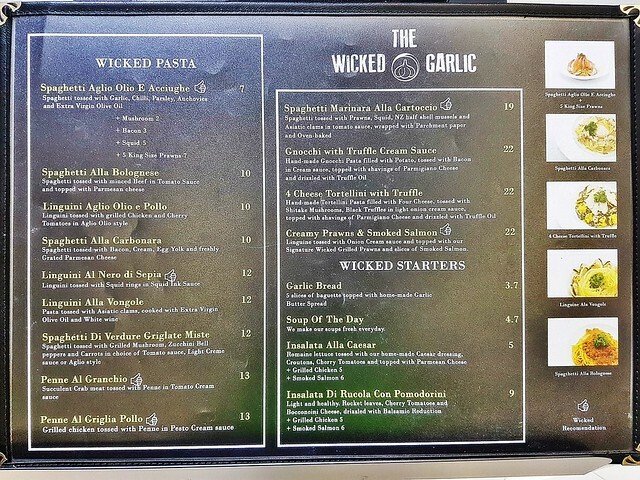 Service at The Wicked Garlic is efficient, but not so engaging, unless the founder, Stanley Heng, is around. 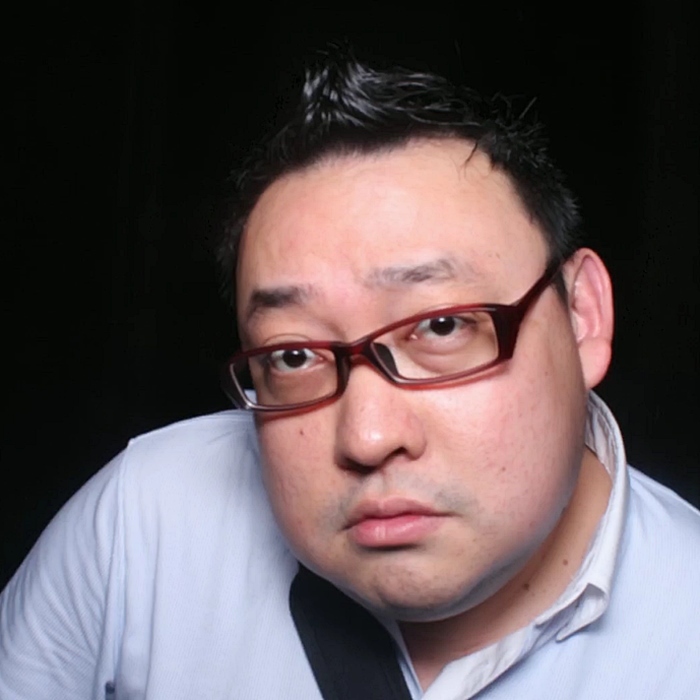 Staff quickly but quietly seat diners, and can make simple recommendations, though they don't display much product knowledge as the menu is comprehensive. However, they will accede to simple special requests. I note that staff are efficient at clearing away empty / dirty tables when diners leave, but they don't make effort to check on diners during the meal. 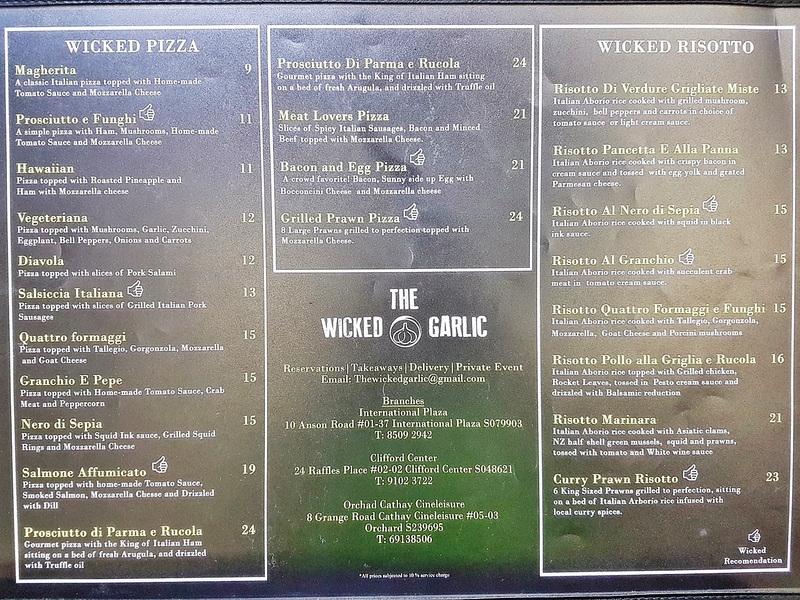 Food at The Wicked Garlic is casual Italian cuisine. 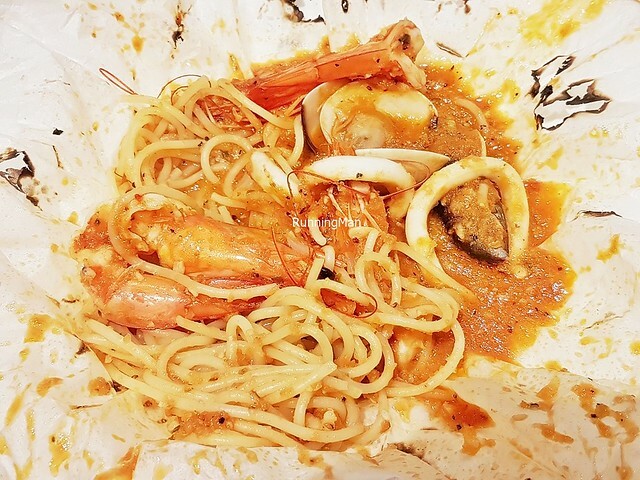 Initially, they introduced authentic Italian dishes, but found that the majority of Singaporeans didn't take to it. 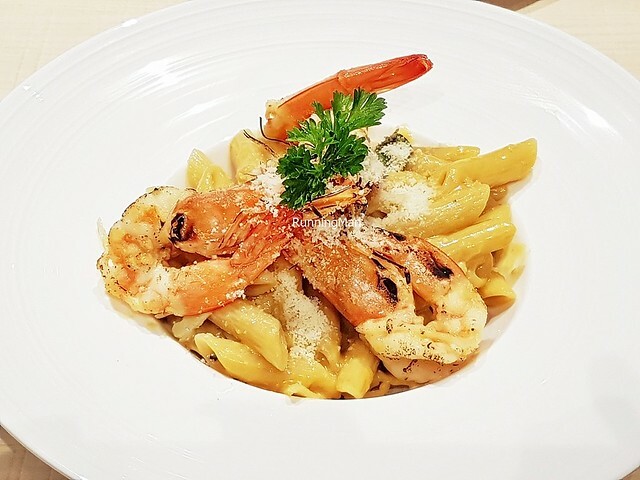 Hence, they've since modified their food to suit the local palate; however, you can still request for the authentic Italian style if you wish. 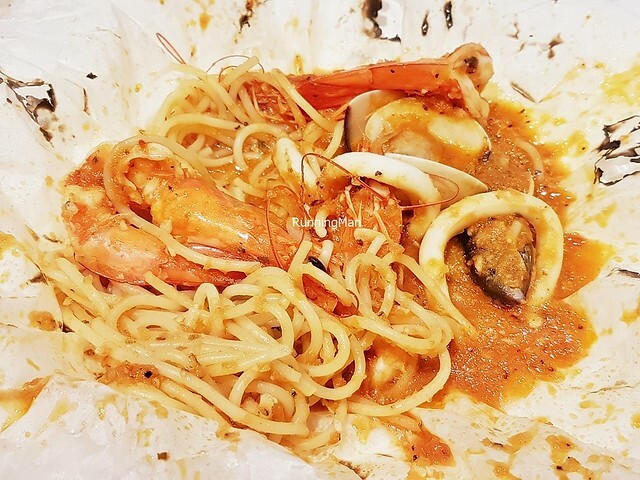 The toned-down, local version sees loads of fresh seafood, which is shipped in every other day (every 2 days), loads of garlic and chili, bold and robust flavours, and soft pasta noodles. Portions are large, and can be shared. 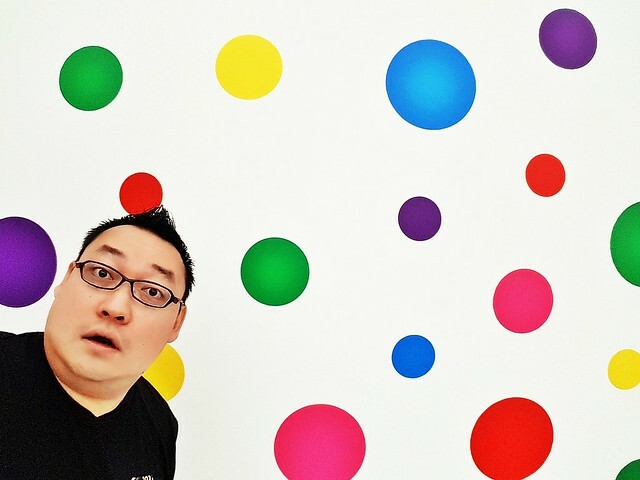 Prices are affordable and wallet-friendly, comparable to elsewhere. Budget about SGD $25 per person for a meal here. 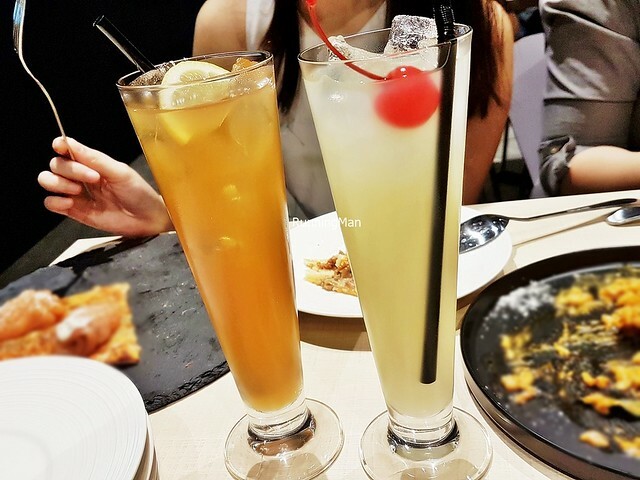 The drinks, such as the Wicked Lemon Tea (SGD $4.50) & Lime Juice (SGD $4.50), are pretty standard thirst quenchers. Arrived slightly late to find my friends had already started on the Spaghetti Marinara Alla Cartoccio (SGD $19), resulting in a messy-looking photo. The spaghetti pasta noodles are done soft, for the majority of locals, but can also be done al-dente on request. The seafood, a medley of New Zealand greenshell mussels, Asiatic clams, king prawns, and squid, is fresh with bouncy chewy textures, nicely sweet savoury in flavour. The tomato sauce is freshly made, but because Singaporean tomatoes are juicy but less sweet than Italian tomatoes, the resulting gravy has a delicate sweet sour flavour. I like that it's thick, not watery in texture. The dish is wrapped in parchment paper then oven baked, when presented and unwrapped, the aromatic fragrance is so enticing. 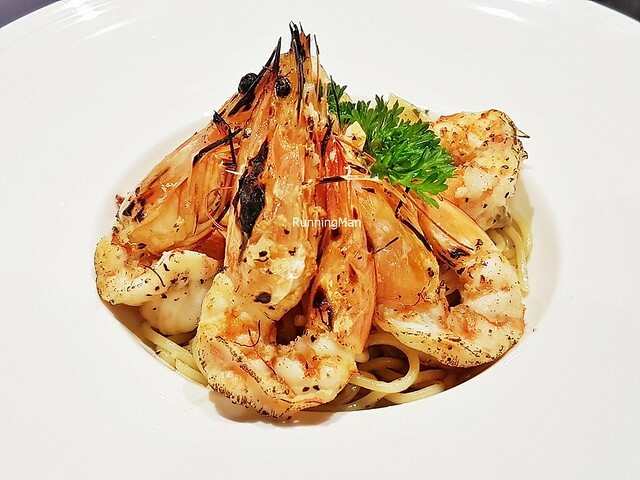 The Spaghetti Aglio Olio E Acciughe With King Prawns (SGD $14) has spaghetti pasta noodles liberally garnished with garlic, chili, parsley, anchovies, and extra virgin olive oil. But you can request for the authentic version, which is done al-dente and has less garnish, the flavour instead infused into the oil. Flavours are savoury herbal salty, nice. 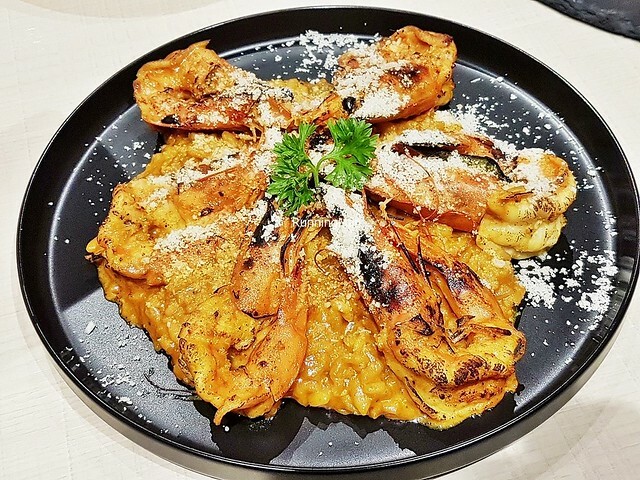 The large and meaty king prawns are nicely grilled, smoky and sweet savoury in taste. I personally would like to have this more spicy. 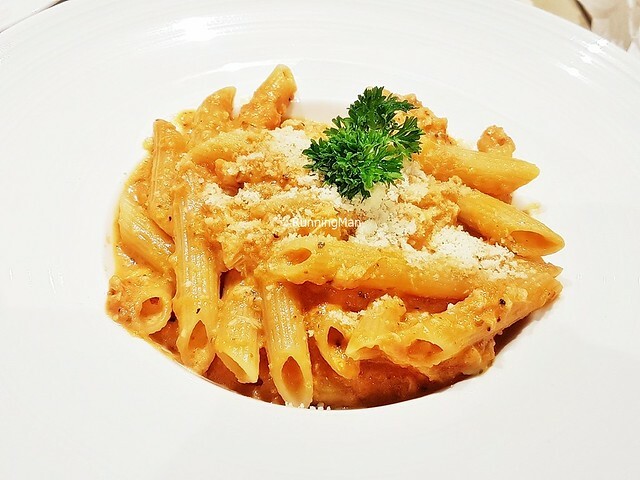 The Penne Al Granchio (SGD $13) is done with a tomato cream sauce / pink cream sauce. The al-dente tubes of penne pasta noodles are nicely chewy with a slight bite, and pick up the rich, thick gravy beautifully. Fresh deshelled chunks of crab meat help fortify this dish, giving it a lovely sweet savoury salty flavour. 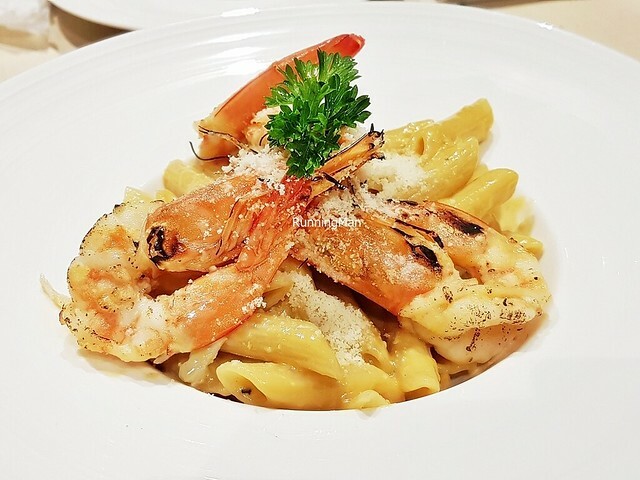 The Penne Salted Egg With King Prawns (SGD $? - Off-Menu Dish) is an off-menu dish... it's actually the staff's favourite dish as part of their staff meal. 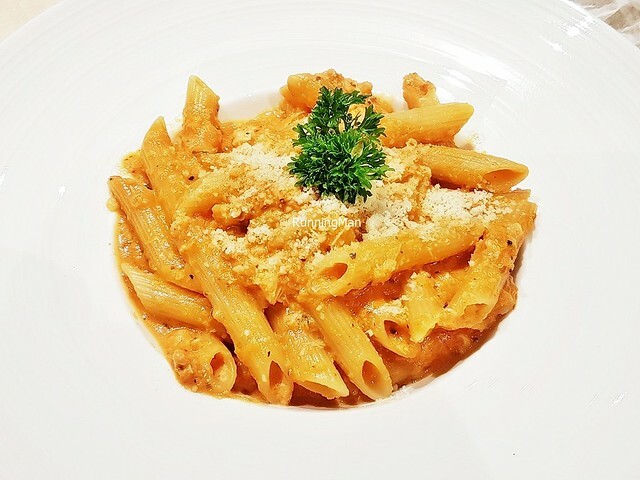 The al-dente tubes of penne pasta noodles are nicely chewy with a slight bite, and the thick gooey salted egg yolk sauce is nicely savoury salty eggy in taste. 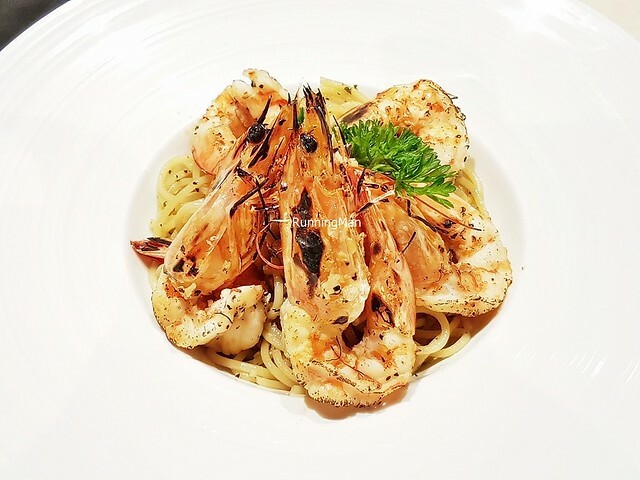 Paired with the large, meaty, well grilled king prawns, which lend a smoky sweet savoury flavour. With all the liberal use of prawns in their recipes, it's little wonder that they use around 1.5 tonnes of prawns across all their outlets monthly. 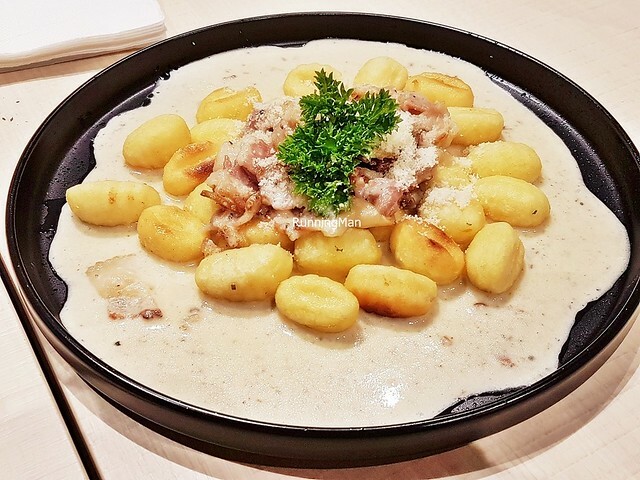 The Gnocchi With Truffle Cream Sauce (SGD $22) was the weakest dish for me, because it's totally nothing like what I expect from a gnocchi. These hand made, potato filled gnocchi pasta dumplings are pan-fried, resulting in a crispy exterior, instead of being soft and chewy. I understand it's to prevent the gnocchi from clumping together, but I still couldn't accept this texture. 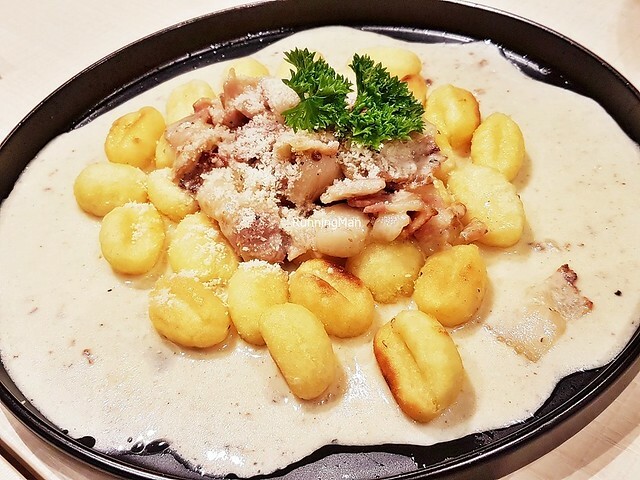 Served in a rich cream sauce, garnished with crispy bacon, parmigiano-reggiano cheese, and truffle oil, the dish is intensely salty with notes of earthy. Overly salty for me, couldn't take more than a few bites of this. 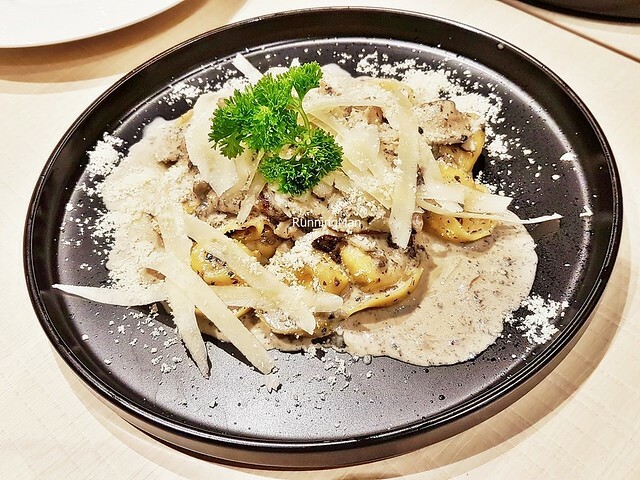 I like the 4 Cheese Tortellini With Truffle (SGD $22), the hand made tortellini pasta dumplings are filled with a mix of 4 cheeses (mozzarella, taleggio, goat, and gorgonzola), resulting in a creamy burst of salty savoury flavour when bit. 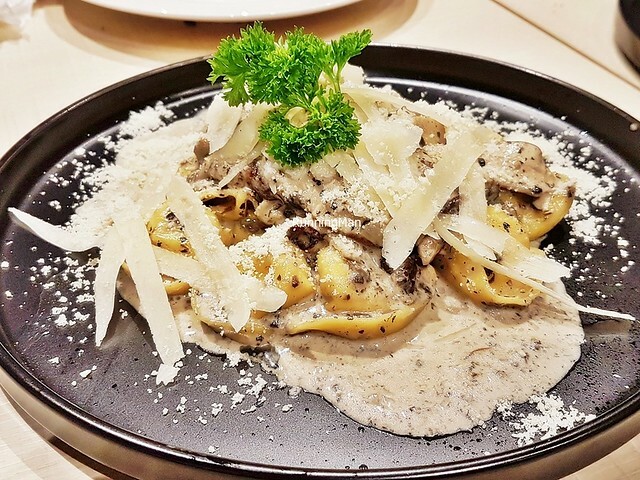 Served in a light onion cream sauce infused with truffle oil, garnished with shiitake mushrooms, black truffles, and parmigiano-reggiano cheese. This dish has a bold, earthy savoury salty cheesy flavour. Would be better if the truffle oil was toned down slightly. 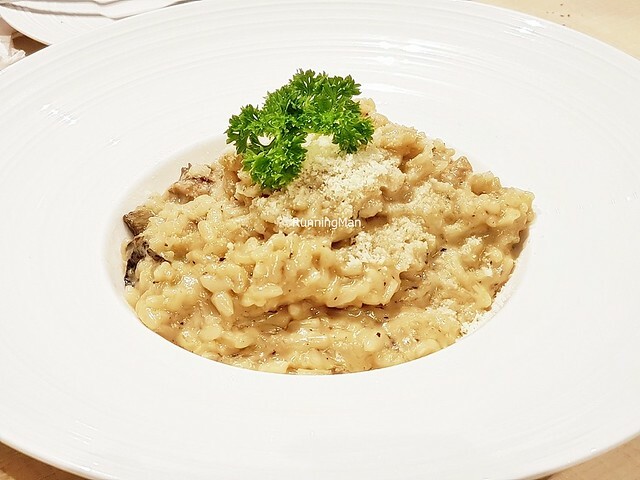 The Risotto Quattro Formaggi E Funghi (SGD $15) is a dish for the strong. 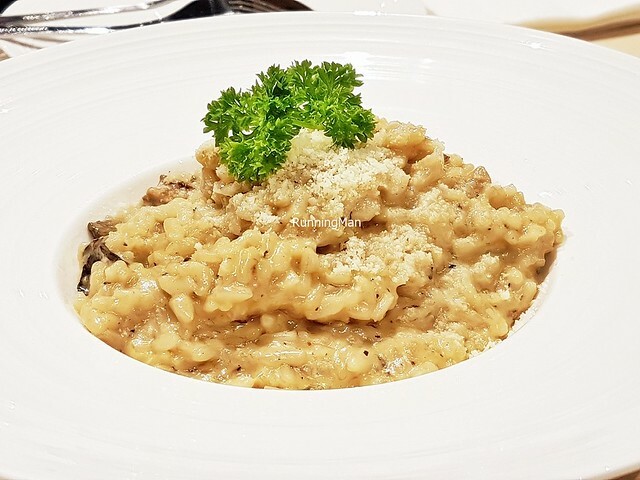 The short-grain Italian arborio rice is infused with a mix of 4 cheeses (mozzarella, taleggio, goat, and gorgonzola), and porcini mushrooms, along with mushroom stock. Flavour is in-your-face intense with earthy and cheesy notes, like a ton of bricks on the palate, and very filling in the stomach. Stanley warned us that this dish would be an acquired taste before serving it. He's right. This absolutely needs to be shared, and is only manageable when eaten in small portions. Felt the Risotto Curry Prawn (SGD $23) was very good, amongst the best dishes we sampled here. 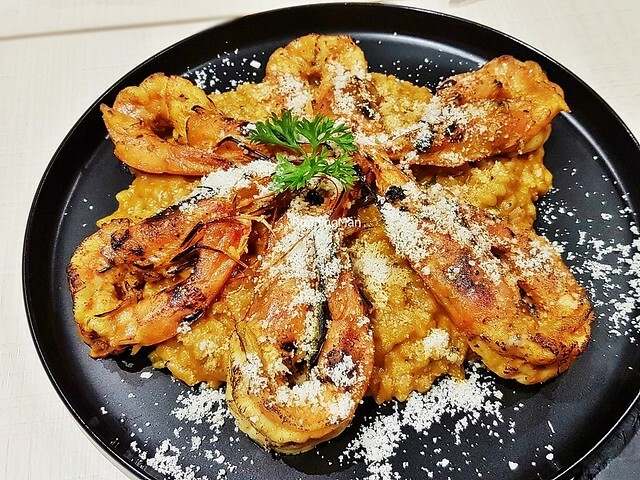 The short-grain Italian arborio rice is infused with hand ground curry powder, sourced from a supplier in the Little India area of Singapore. This gives the dish a savoury spicy flavour, rather akin to a thick South-Indian style curry in taste. 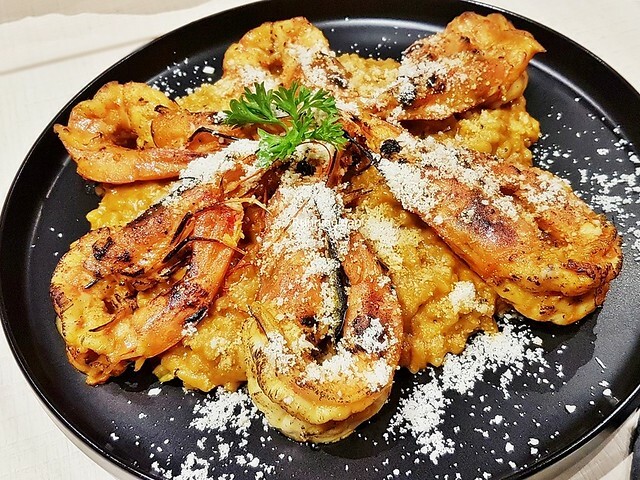 Topped with fresh, large, meaty king prawns, grilled to smoky sweet savoury perfection. Excellent dish. Highly recommended! 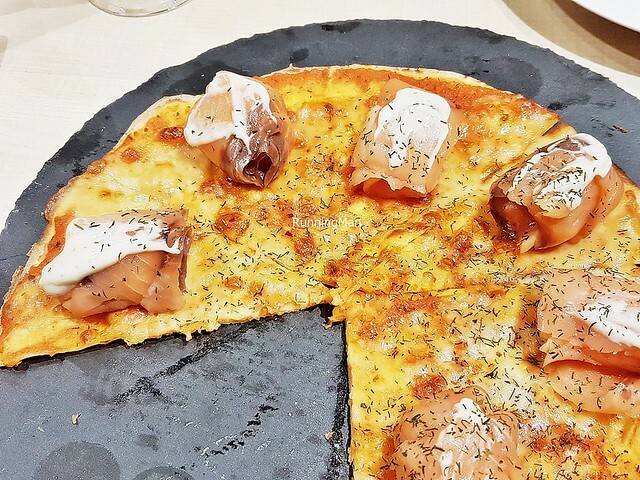 The Pizza Salmone Affumicato (SGD $19) has a hand made, thin crust pizza base that is satisfiyingly crispy. 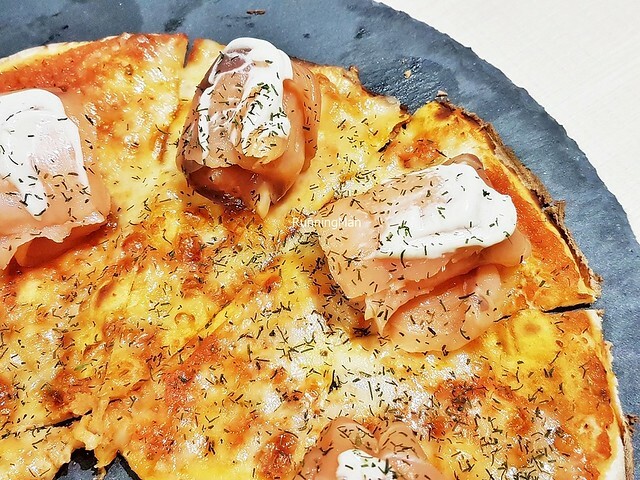 Topped with homemade tomato sauce, thick slices of smoked salmon fish, gooey mozzarella cheese, a spot of sour cream, and dill herbs. Love the combination of smoky, savoury, salty, sweet, sour, bitter, herbal flavours here. 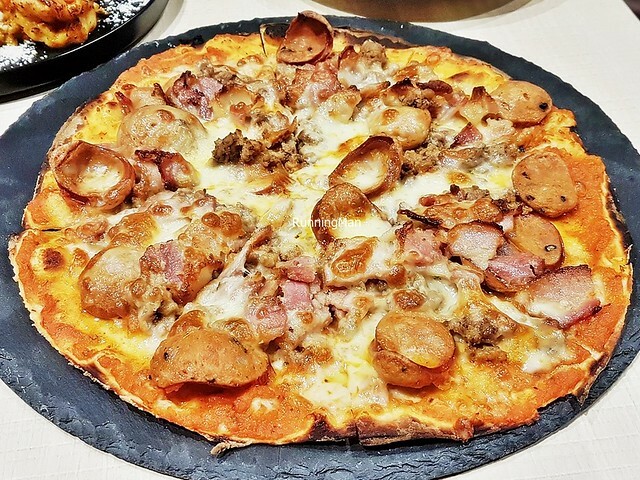 Delighted by the Pizza Meat Lovers (SGD $21), and I can see this being very popular. 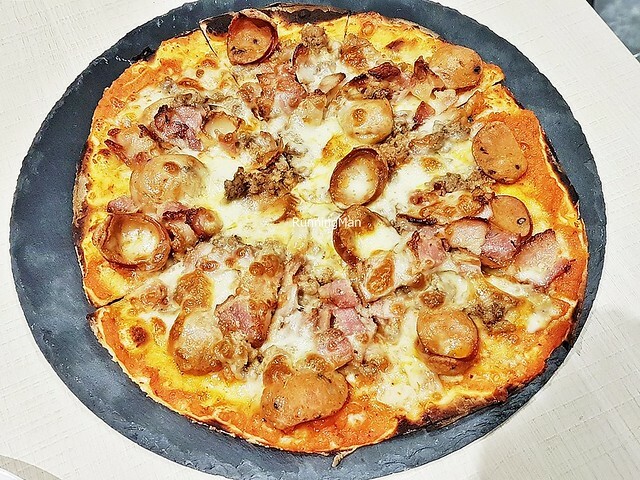 The hand made, thin crust pizza has a nice crunch, and is topped with homemade tomato sauce, spicy Italian sausages, minced beef, bacon, and mozzarella cheese. Flavour is distinctly meaty savoury salty, with a touch of sweet and cheesy. Good! 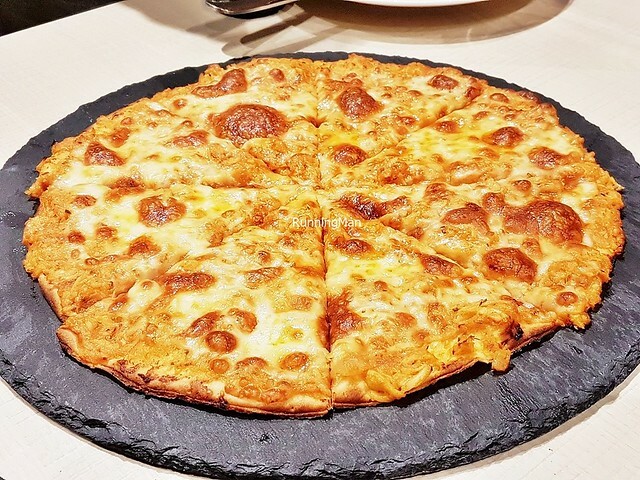 The Pizza Granchio E Pepe (SGD $15) looks rather bland, but the flavours of sweet and savoury really shine here. 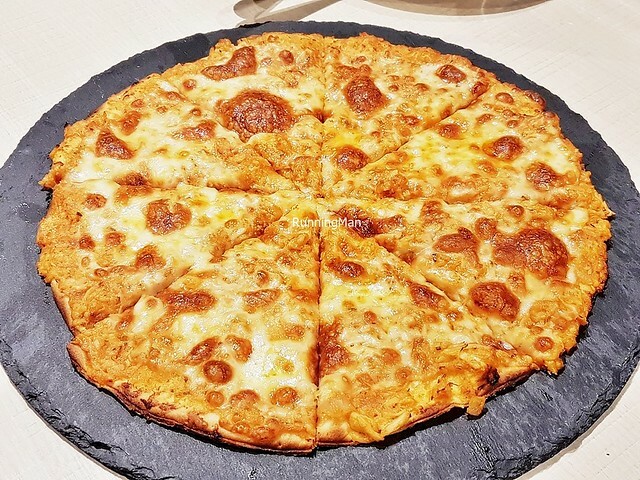 The hand made, thin crust, crunchy pizza base is topped with homemade tomato sauce, chunks of deshelled crab meat, and peppercorn. The sweet savoury notes of the crab meat really shine, but I wish the peppery flavour was more pronounced. 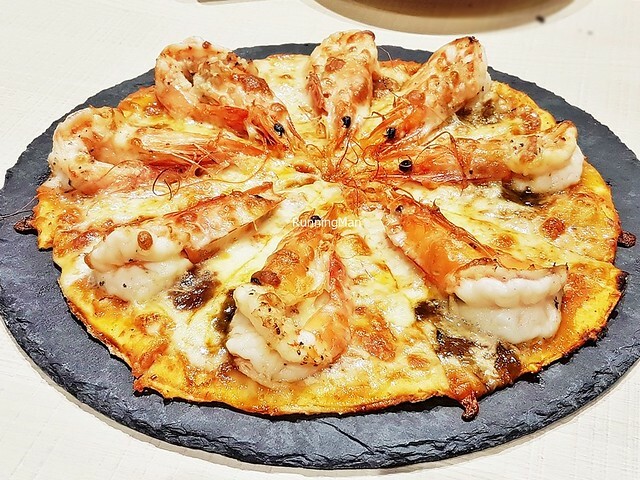 The Pizza Grilled Prawn (SGD $24) is an over-the-top house creation, and amongst their most photo-worthy dishes. 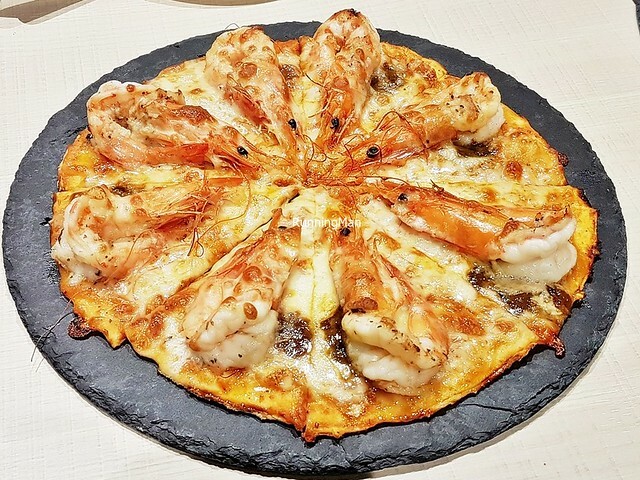 No less than 8 large, meaty king size prawns, perfectly grilled with smoky sweet savoury flavour, each sitting on a slice of the hand made, thin crust pizza. Served with the shell on, the prawns are juicy, but make the pizza base less crisp too. Completed with gooey mozzarella cheese, this evoked wonderment when it arrived at the table. 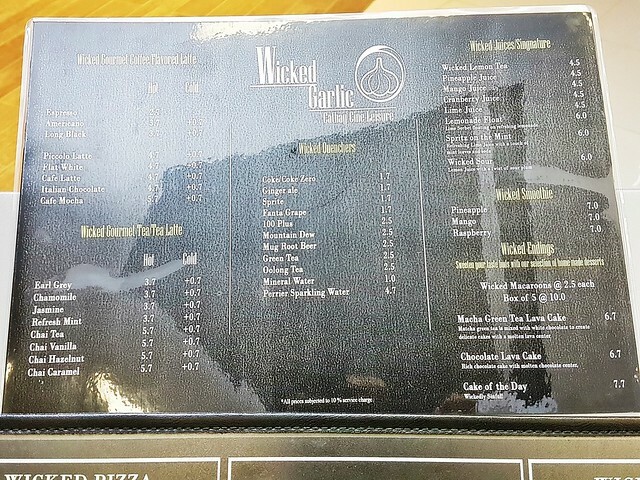 Personally, I like that you're almost assured of a good meal every time you visit The Wicked Garlic. Their 3rd outlet in Cathay Cineleisure Orchard has the most comfortable ambience, though service remains functionally basic. But the food is the main highlight of a visit to The Wicked Garlic, delicious, hearty, and affordable. I would return for more!